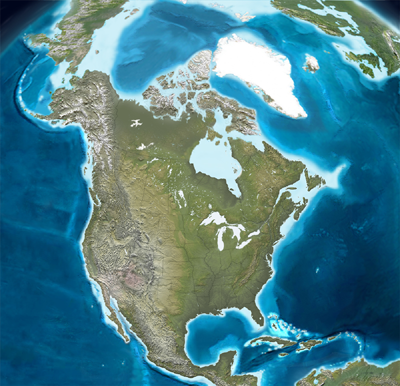 Geografi: Canada er en demokratisk nordamerikansk forbundsrepublik med grænser til USA, Alaska og Grønland og med kystlinjer til Atlanterhavet og Stillehavet. Der er en nationalpark Peace Park / Fredspark på grænsen mellem USA og Canada. Christmas Island, Nova Scotia. 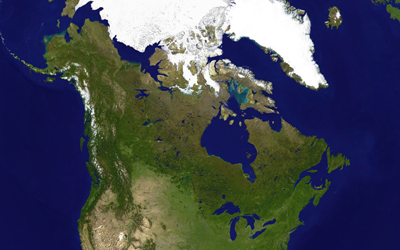 Geography: Canada is an North American democratic, federal republic with borders to the United States, Alaska and Greenland, and with shorelines to the Atlantic and the Pacific. There is a National Peace Park on the border between the United States and Canada. Christmas Island, Nova Scotia. Canada: A Reader’s Guide./ : J. André Senécal ; edited by Linda M. Jones with the assistance of Ginette Hébert & Claudine Guenette = Canada : introduction bibliographique / J. André Senécal ; sous la direction de Linda M. Jones avec l'assistance de Ginette Hébert & Claudine Guenette. - Ottawa : International Council for Canadian Studies = Conseil international d'études canadiennes, c2000. Catalogue of pamphlets, journals and reports in the Dominion archives 1611-1867, with index. [Prepared by Mr. McArthur of the Archives Branch]. - Ottawa : Government Printing Bureau, 1911. Edwin Alden & Bro. 's American newspaper catalogue, including lists of all newspapers and magazines published in the United States and the Canadas ... their politics, class or denomination, size, and estimated circulation. Also special lists of religious, agricultural, the various class publications, and of all newspapers published in foreign languages, and a list ... by counties - Cincinnati, New York: E. Alden & bro. 's advertising agency, 1882. Catalogue of pictures including paintings, drawings and prints in the Public Archives of Canada ; with an introduction and notes / by James F. Kenney ; published by authority of the Secretary of State under the direction of the Keeper of the Records. - Ottawa : Mortimer Company, Limited, 1925. Canada er medlem af Arktisk Råd, FN, IAEA, International Commission on Intervention and State Sovereignty, det internationale energiagentur, det internationale havundersøgelsesråd ICES, NATO, the North American Aerospace Defense Command / Den canadisk-amerikanske fælleskommando, OAS, OSCE. Forsvar / militær: SIPRI: Militærudgifter / Military expenditure of Canada. Værnepligt: WRI: Country report and updates: Canada. Det canadiske militær var udstyret med kortrækkende amerikanske kernevåben i Canada og i Vesttyskland under Den kolde krig. Atomvåbenuheld. Defence White Paper 1994, Department of National Defence, 1994. Canadian nuclear weapons: the untold story of Canada's Cold War arsenal. / John Clearwater. - Toronto: Dundurn Press Ltd., 1998 - 309 s.
U.S. nuclear weapons in Canada. / John Clearwater. - Toronto: Dundurn Press Ltd., 1999. - 298 s.
Inventory of the military documents in the Canadian archives prepared by Lieut. Col. Cruikshank. - Ottawa : Govt. Print. Bureau, 1910. 4 microfiches (196 fr.) CIHM/ICMH Microfiche series = CIHM/ICMH collection de microfiches ; no. 82262 "Published by authority of the Minister of Agriculture under the direction of the Archivist." Original issued in series: Publications of the Canadian Archives ; no. 2. Port Hope Community Health Concerns Committee - The Port Hope Community Health Concerns Committee (PHCHCC) is an incorporated nonprofit community organization which was established in 1995. Port Hope Radiobiological Studies Project 2007 : Presented and Peer Reviewed at the EANM Congress 2007 - Copenhagen, Denmark: The Quantitative Analysis of Uranium Isotopes in the Population of Port Hope, Ontario Canada / Asaf Durakovic, Axel Gerdes, Isaac Zimmerman. Uranium Medical Research Center. Nielsen, Jørgen Steen: Olie-lækage truer Keystone-rørledning. I: Information, 08/01/2013. Naturressourcer: Aluminium, asbest, cæsium, germanium, guld, helium, kopper, kobolt, kul, lapis, nikkel, niobium, olie, oliesand og naturgas, platin, radium, selen, stensalt, sølv, tjæresand, uran, vanadium og zink. A raging wildfire in a Canadian tar sands town has forced tens of thousands of evacuations and destroyed several residential neighborhoods, offering a bleak vision of a fiery future if the fossil fuel era is not brought to an end. The blaze in Fort McMurray, Alberta, started over the weekend, doubled in size on Monday, and grew into an inferno on Tuesday. It is expected to worsen on Wednesday as strong wind gusts and record high temperatures persist. Fort McMurray is home to the Athabasca tar sands, the largest single oil deposit in the world, containing an estimated 174 trillion barrels of bitumen. Tar sands oil production is the fastest growing source of greenhouse gas (GHG) emissions in Canada, and greatly increases the country's contribution to global warming. An atlas of lithofacies of the McMurray Formation Athabasca Oil Sands Deposit, northeastern Alberta : Surface and subsurface. / : Frances J. Hein, Darrell K. Cotterill and Habtemicael Berhane. - Edmonton : Alberta Energy and Utilities Board ; Alberta Geological Survey, 2000. The chemistry of Alberta oil sands, bitumens and heavy oils. / : Otto P. Strausz, Elizabeth M. Lown. - Calgary, Alta. : Alberta Energy Research Institute, c2003. Historical overview of the Fort McMurray area and oil sands industry in northeast Alberta : With expanded bibliographies on oil sands, surficial geology, hydrogeology, minerals and bedrock in northeast Alberta. / :Frances J. Hein. - Edmonton : Alberta Energy and Utilities Board ; Alberta Geological Survey, 2000. Governing Uranium in Canada. / : Cindy Vestergaard. DIIS Report, 2016. CRS: Europe’s Energy Security: Options and Challenges to Natural Gas Supply Diversification. / Michael Ratner et al. 2012. - 32 s. Elmelund, Rasmus: Pensionskasser fortsætter støtte til ulovligt olieprojekt: Statoil har erklæret sig skyldig i overtrædelse af den canadiske miljølovgivning i forbindelse med udvinding af oliesand, men danske pensionsselskaber støtter ufortrødent det kontroversielle - og nu ulovlige - projekt med danskernes sparepenge. I: Information, 09/03/2011. Story of the Springhill disaster : comprising a full and authentic account of the great coal mining explosion at Springhill Mines, Nova Scotia, February 21st, 1891 : including a history of Springhill and its collieries : also, a descrption of the underground workings, mechanical operations and mysteries of the mine, reviews of other great coal mining disasters, coal and its history, danger of mining operations and safeguards against accidents in mines, explanation of coal mining terms, lessons from the great calamity, etc. (1891). Erhverv, handel og industri: Society of American Archivists Business Archives: Directory of Corporate Archives in the United States and Canada. Atomkraftværker. Produktion og eksport af: Biler, cement, medicin, fly, tog, våben. Statistics Canada : Canadian exports and imports. Craig Byrd: Foreign Control of Canada’s Merchandise Exports, 2002. The United Nations has released a damning report into the operations of Canadian mining company Nevsun Resources in Eritrea, which accuses the company of using conscripted labour at it's Bisha Mine in the country. Nevsun estimated that the mine held over a billion pounds of copper and 2.7 billion pounds of zinc. The report accuses Nevsun Rescources, via it's subsidiary the 'Bisha Mining Shareholders Corporation' (BMSC), of using forced labour sourced from conscripted members of the Eritrean military, using testimony collected from Eritrean refugees who were conscripted into the states 'national service' programme. Hear No Evil: Forced Labor and Corporate Responsibility in Eritrea’s Mining Sector.